Brett Favre was anything but boring. The southern everyman battled opposing defenses, his own team, and the decline of his abilities. While his roller-coaster career may have cost him some fans along the way, Brett Favre is still one of the most popular former players and his cards and memorabilia are in high demand. Shop for Brett Favre Autograph Cards on eBay. Over his 20-year NFL career, Brett Favre broke plenty of records and had tons of football cards. They weren't all great, but several cards have separated themselves from the rest. 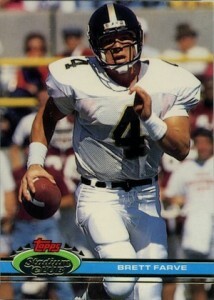 The following list looks at ten of the best Brett Favre cards from throughout his Hall of Fame career. While the list below features cards from throughout his career, view the earliest cards for the QB with a complete Brett Favre rookie card guide. Click on the images or listings to shop for cards on eBay. Linked sets in the body go to full set profiles. Despite spelling his name wrong, 1991 Stadium Club is the top rookie card option for Brett Favre collectors. The Super Bowl XXVI parallel, shown on the right, takes the card to another level. If you look in the corner of the SB parallel, you should just be able to make out the faint embossed logo that helps indicate the rare parallel. While it might not be great from a design perspective, 1991 Wild Card Draft was ahead of the parallel trend that would take hold of the hobby. 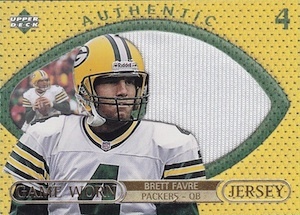 Offering various Stripes parallels, the first-year Brett Favre card was once the top draw for collectors. While they are are no longer redeemable, the concept was centered around a program that allowed collectors to submit the various parallels in exchange for the specific number of base cards. There are a total of seven different versions and the six parallels are shown below. The rarest is the 1,000-stripe parallel and those rarely surface. Marking his offseason trade to the Green Bay Packers, 1992 Stadium Club is arguably just as popular as his Stadium Club rookie, and considerably more rare. The card was included as part of the short print high series and this keeps values high. 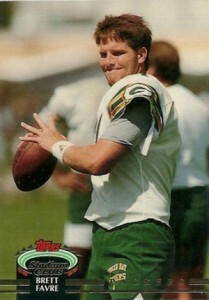 It also helps that Favre is in the familiar Packers uniform. While 1994 Finest has not maintained great value over the years, the Refractor parallels are rare enough to still command a premium. 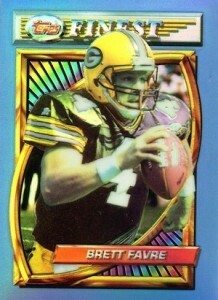 This early Brett Favre parallel is shiny and colorful, and in the collecting world, that is a pretty good start. Also, the combination of the light and Refractor-finish has given the appearance of a jersey that is half green and half purple. Was this an example of impressive foreshadowing by Topps, over a decade in advance? We may never know for sure. Given how long ago they were issued, Autographics cards for the elite players are quite rare. 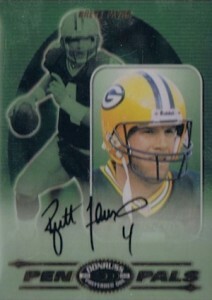 But the Brett Favre card from the 1997 autograph insert is much more rare because there is no base version. 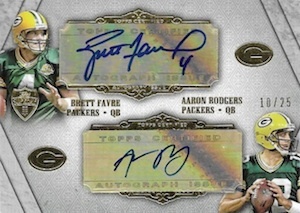 Unlike the majority of the checklist, Favre only signed Century Mark parallels. Hand numbered to only 100, these do not appear often. 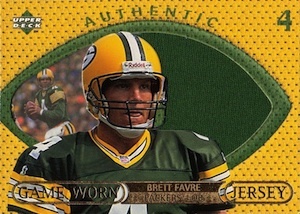 As one of the earliest Brett Favre relic cards, 1997 Upper Deck Game Jersey offers two versions. Card #GJ4 includes a green jersey piece, while #GJ5 features a white jersey piece. The football shape and team colors give the cards a bold and unique look. Donruss Preferred QBC might feel like a distant memory, but the set included an impressive assortment of on-card Brett Favre autographs. The short print Pen Pals autograph set features dual, triple and quad cards, including Favre and various big-name players. Favre was individually paired with John Elway, Jerry Rice and Troy Aikman on the dual cards, and paired with Dan Marino and John Elway on a triple card. A rare quad card combines Favre with Elway, Marino and Peyton Manning. There is also a main version, signed only by Brett Favre. 2009 was the height of Brett Favre-mania. Favre had once again retired, only to return to the game he loved. This time he donned the vivid purple of his formal rivals, the Minnesota Vikings. 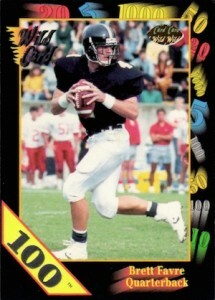 Once he officially signed, the race was on to get Favre cards into products. 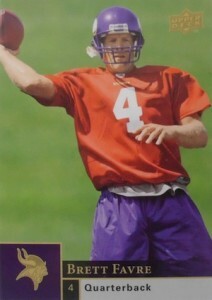 Although Upper Deck was not able to include him in 2009 Upper Deck Football, the same design was used on a pair of short print variations. The rare cards were included as inserts in 2009 SPx. Although both have limited print runs, the version on the right, which shows him holding his jersey, is much tougher to find. An ornate design, complete with silver foil and an on-card signature, gives this Brett Favre autograph from 2012 Five Star an elegant look. Numbered to 85, it is plentiful enough to keep values from getting out of control but still quite limited. 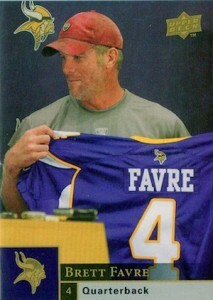 Favre has also appeared in other seasons with the Five Star brand. 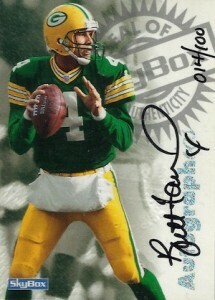 One of several cards that pair the former teammates, Brett Favre and Aaron Rodgers are the past and the present of the Green Bay franchise. This Topps Supreme card from 2012 is limited to just 25 copies. As his signing has picked up in retirement, Favre is found in many high-end sets with on-card autographs. These premium autographs will continue to see strong interest from collectors. 1991 Topps Stadium Club - Brett Favre ROOKIE CARD #49 RC HOF Farve NICE! 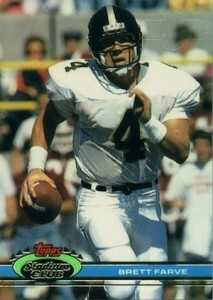 They should have added the Skybox Leather Favre – My Fav of All-Time!!! Thank you for another article on the future “Hall of Fame” Quarterback Brett Favre. As your article correctly states; “You either love him or hate him”, there is really no in between. What I’ve found most interesting was the fact that every prime time televised game in which Favre played had always commanded high viewership ratings. This fact in turn has boosted his popularity with football card collectors, as his products were always in demand. With amazing statistics and an even more amazing career, the iconic Brett Favre will only gain momentum in his legendary feats. 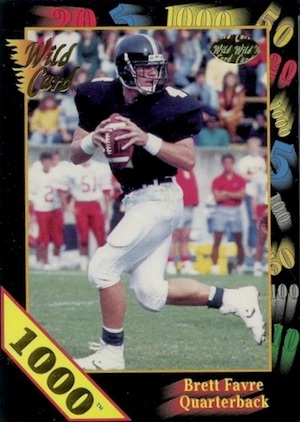 I must add that my all time favorite card in my collection is the 1991 Star Pics Auto (Unofficial) Rookie Card of Brett Favre. I was fortunate enough to locate and purchase one approximately a year ago. With the information given by Ryan Cracknell in a previous article from Cardboard Connection, I was able to ensure that the auto and gold seal was on the back of the card, and not the front as the latter is subject to a counterfeit. The information given to collectors via Cardboard Connection is priceless. Keep writing up the fantastic articles and the great work!